To tell you the truth I am not very fond of sweets or chocolates. An occasional bite is ok but not more than that. Oh no!!!!! I am not watching my calories. That is the last thing that I do when I cook or eat. I eat what I like but sweets are my last choice. Wait a minute, I am getting side tracked from this post. This is my first trial of making halwa. I have not made one before, for that matter not any halwa. I have tasted it in some of the wedding feasts where it is always laden with sugar and ghee which makes it impossible to have more than one mouthful. I have come across a few recipes across the blogosphere which were awesome but I personally don't like the blunt sweet flavour of sugar. 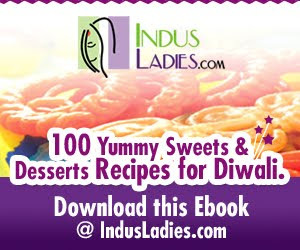 The results were superb .... Only after making the recipe I knew how easy it was to make a "Traditional Indian Dessert". 2.Place a large non stick kadaii on medium flame. 3.Add the milk and bring to a gentle boil. 4.Add the carrots and cardamom powder and mix well. 5.Simmer and keep stirring often until all the milk is absorbed and the carrots are cooked. 6.Add the condensed milk and mix well. 7.Keep in very low flame until the mixture thickens which will take around 5-10 minutes. 8.Melt ghee in a small pan and fry the cashews and raisins. 9.Add to the halwa along with the nutmeg powder. 10.Mix well and remove from flame. Note: The sweetness from this amount of condensed milk is mild. Feel free to add more of it according to your preference. Enjoy warm or cold. It is best served warm with a scoop of vanilla icecream. Sending this to "Veggie/Fruit of the month - Carrots" , an event started by Priya of Mharo Rajasthan Recipes, guest hosted by me. wow..... mouthwatering recipe...this is my fav...looks absolutely delicious. Nice clicks too. My fav halwa.. looks perfect..
Yummy halwa..always ma fav among halwas.. Superb clicks too..
Wonderful,beautiful and aesthetic clicks..I loved them..Nice recipe too ! I love the texture of this halwa. you can really see the shreds of carrot. a warm scoop of halwa with cold vanilla ice cream! too bad I don't have a sweet tooth...thanks for leaving a comment Reva. so well done reva- I as always look at your clicks and forget everything else (:p) ! 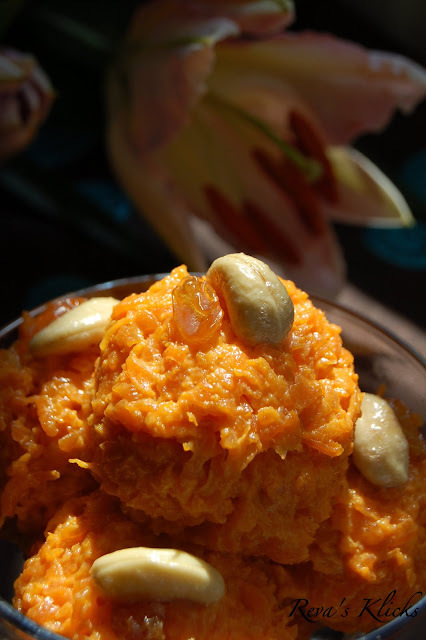 Yumm...yumm carrot halwa.. my husband's favorite..
Its always as run away recipes in my home..Delicious & superb click..
Slurpp..with a scoop of vanilla ice cream it just way beyond perfect dessert!! wow! love the close ups :) how inviting - nice post dear! Perfect and tempting halwa.. looks absolutely inviting..
Wow mouthwatering carrot halwa looks so tempting and inviting. Nice clicks first of all,great effort! And yummy carrot halwa,what a colour! 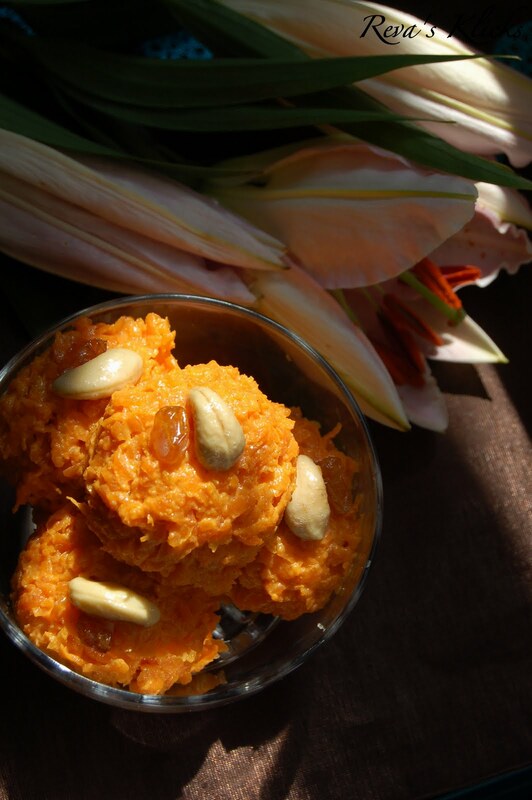 Yummy carrot halwa..nice pics...another of my favorites and ur halwa looks absolutely mouthwatering. You are so blessed Reva that you dont have a sweet tooth. that way you dont have deal with indulgences and excess fat...the halwa looks wonderful. gorgeous colour there. Who would not love this bowl of lovely sweet. YUM! Lovely pics Reva. This is one of my fav. Mouthwatering and excellent presentation. 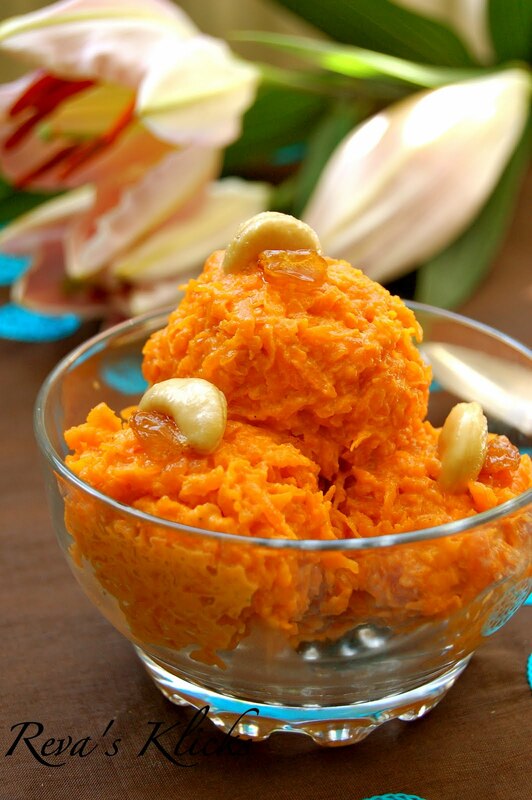 Delicious carrot halwa..one of my favorite dessert..love the color, it looks so tempting!! Wow...nice clicks Reva!! !Luks sooo Tasty!! Beautiful pictures sweetheart!!! loved the flower and the halwa....lovely and yummy!!! Congratz!!! 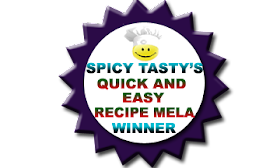 You are the lucky winner of our "Quick and Easy Recipe Mela". 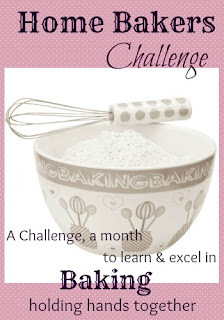 We have featured your recipe and awarded you a badge. Please come and collect it. Congrats Reva for quick and easy mela...celebrating already!!!! 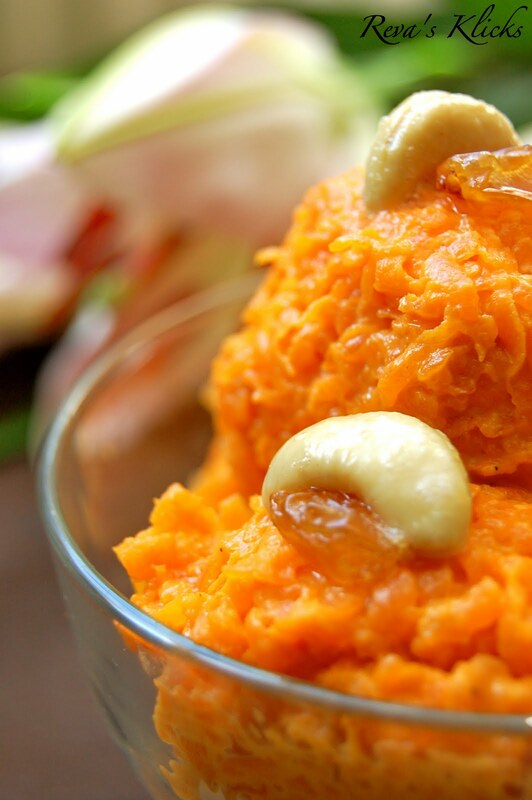 delicious looking carrot halwa.. Very very beautiful ~ you make a cool dessert all the more appetizing by your presentation,always a crowd-pleaser ! Just wanted to check if archived entries are allowed for this event on Carrot. Delcious halwa, my all time fav, awesome clicks. My all time fav halwa..looks so yum! Nice clicks! beautiful clicks!!! halwa looks heavenly! That's a nice version of halwa with condensed milk.. Lovely snaps too.. Served in different way and tempting. perfect color. 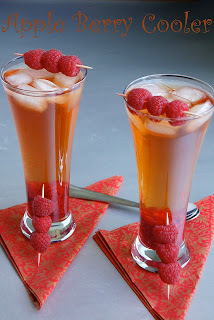 wow that's a lovely event..if you want to see your event news on Food blog plz mail me.